On this last day of 2017, I am considering qualitative elements that can make (or break?) the success of a sustainable development initiative such as the scrumping project and its Fruit Factory by the Brighton Permaculture Trust in Sussex, United Kingdom. As a former marketing professional I know the importance of brand names, and of the words that compose them. However ethical the scrumping project is, I wonder whether the word ‘scrumping’, as well as the brand ‘Scrumped’ on product labels serve this wonderful and effective initiative well. 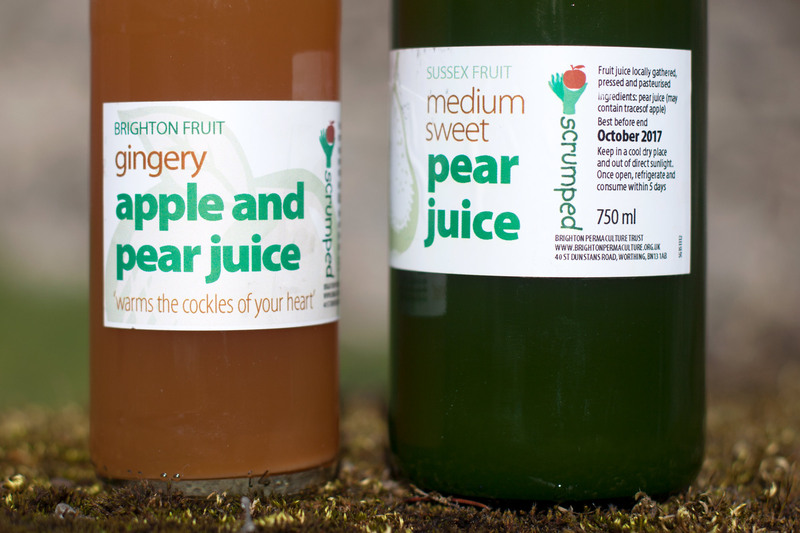 ‘Scrumped’ juices sold by the Brighton Permaculture Trust. I purchased the bottles in December 2016 when I visited its Fruit Factory for the first time. The juice was so delicious! Photo 30 December 2016. My French culture probably makes me less at ease with playing with ambivalence and ambiguity than the British. But the English dictionaries are very clear: to scrump is to steal, for instance ‘to steal (fruit) from an orchard or garden’ in the Oxford Dictionaries, so there is not much ambiguity there. Some may argue that so much fruit is going to waste that something needs to be done, should it involve picking without permission. I personally think asking permission to pick should be a matter of principle. Should words like scrumping be avoided in sustainable development activities? How many people would be, like me, at least slightly put off by the word ‘scrumping’? This is where another argument comes into place. 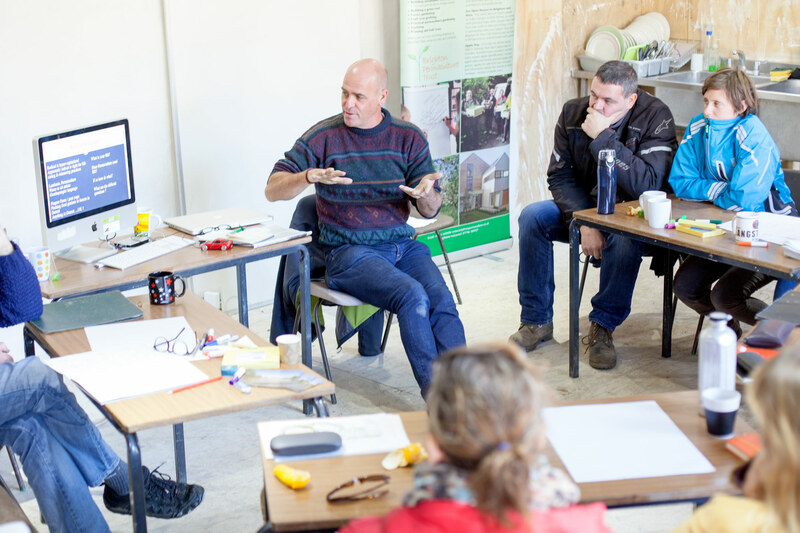 On 29 October, I attended the ‘Taking Permaculture to the Edge’ workshop organised by the Brighton Permaculture Trust at the Fruit Factory in Stanmer Park. We had a great day discussing nearly forty years of permaculture and its future with Dr. Charlie Brennan, a social ecologist and renowned permaculturist with thirty years applied experience of ‘bringing land alive’ in particular in Australia where modern permaculture was born in 1978 with the publication of the book Permaculture 1 by Bill Mollison. Charlie Brennan talking about permaculture at the Fruit Factory. Photo 29 October 2017. He wondered how permaculture could become more mainstream. For instance, he said how controversial and divisive a subject it was in the US. He cited Heidegger, saying that “fracture renders the familiar explicit”, suggesting that this divide had been good in making people see the limits of our current systems of food production. However, wasn’t it now time to make permaculture more consensual and accessible to a wider public? Maybe is it also time to reconsider the name of the scrumping project to make it more consensual? I looked up the word, because in British popular culture it has strong associations with childhood rural idylls – in my mind it is associated with picking up windfalls, rather than taking from the tree. The word itself is quite friendly and child-like. But given the fact that fruit as indeed been stolen wholesale from community orchards (this example a couple of months ago: http://www.bbc.co.uk/news/av/uk-england-sussex-41628541/apples-being-grown-for-food-banks-stolen), I can see your point! Thank you Jac for these insights which show a more positive side of the word ‘scrumping’ in local speech, curiously absent from standard English dictionaries. Something to look further into, I think, as well as the issue of fruit stealing mentioned in your second link.